There are a million different ways you can earn extra income on the side, and I certainly haven’t tried everything. There are a lot of good ideas out there that may be a better fit for you. 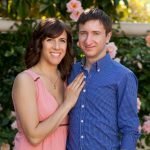 If you want to get some more ideas, I have a Side Hustle Interview Series that documents creative ways others are making money on the side. In addition, I recently contributed to an article that has a lot of great ideas for side jobs you can start without any money. With that out of the way, let’s get to this month’s income report! 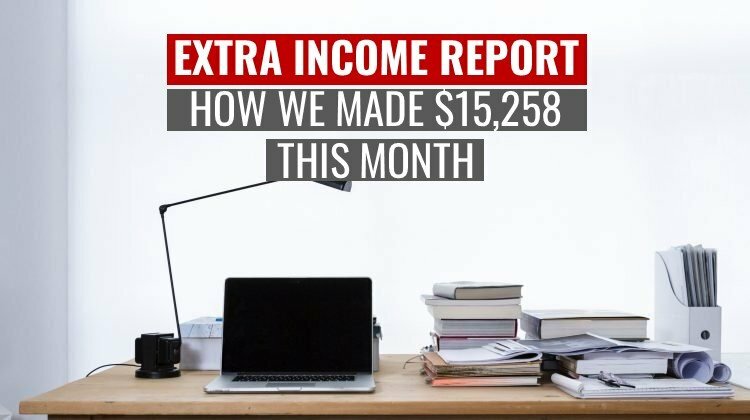 In total, we made $15,258 this month! 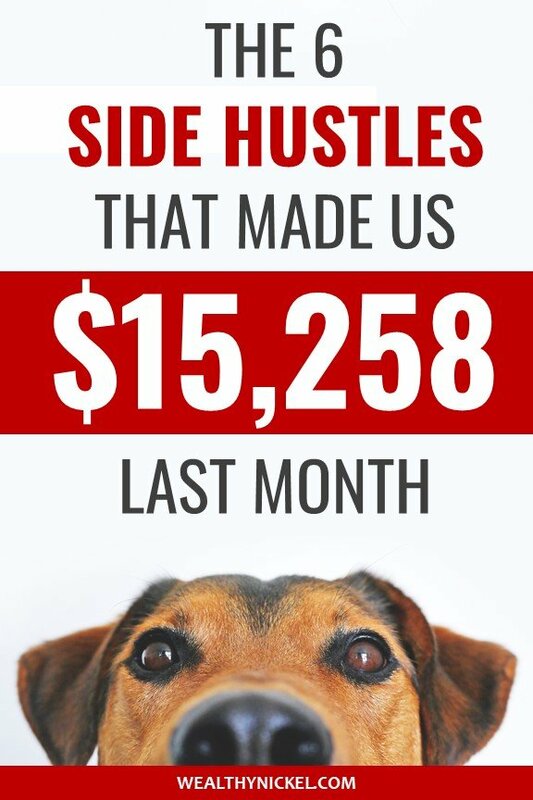 This has been our best month since we started tracking our side hustle income, due mainly to my wife finishing up a real estate transaction and collecting her commission check. 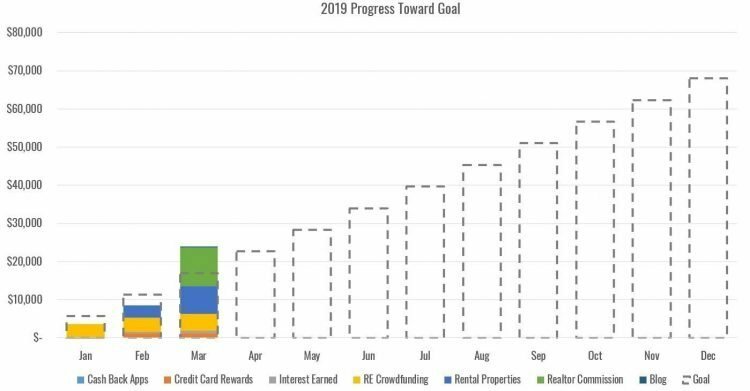 That one check gets us pretty close to our annual goal for realtor income, which is great because there are no other clients on the horizon. 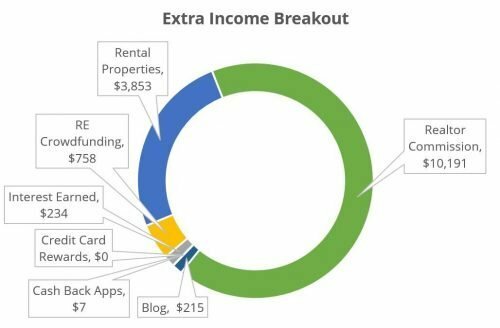 Our side hustle income is generally very lumpy and depends heavily on when my wife pulls in a real estate commission check, or if we have a big repair bill on a rental property. In March, we jumped ahead of our goal to be at $17,000 by the end of Q1. This was in large part due to my wife’s realtor income this month, which we don’t expect to happen again anytime soon. Exciting Update! 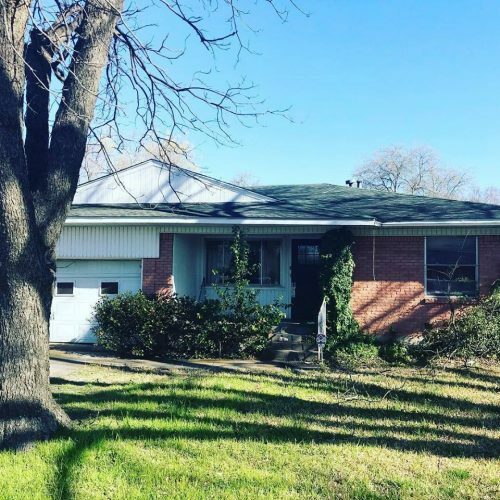 We Closed on a Flip Property! After almost 2 years of back and forth, and distant family members contesting heirship, we FINALLY closed on the property in March! I didn’t put it into our 2019 goals because I honestly didn’t know if we would ever close on the house. 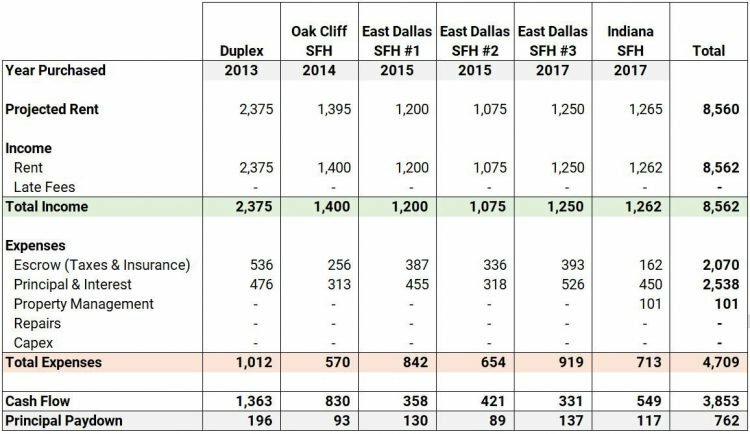 The good news is we basically bought a house in 2019 for 2017 prices, although after sitting vacant for a couple years it will probably need more work than we originally budgeted for. We paid $80,000 for the house, and as of right now it looks like it needs another $80-90,000 worth of work. We will be redoing EVERYTHING – kitchen, baths, floors, roof, plumbing, etc. When we initially put it under contract, we were imminently expecting our second child, so we decided to partner on the deal with another couple we know that invests in real estate – we would bring the deal and they would run the rehab. As it turns out, that second child is now 18 months old, but we are still partnering with them. Hopefully with them doing the bulk of the rehab work – getting bids, managing contractors, etc. it won’t take too much of our time and we’ll both make a good paycheck at the end. Stay tuned to see how things work out! We hope to have the property on the market by June. I have a goal to make an extra $500 per year from cash back apps. $500 per year breaks down to about $42 per month, so we under-performed quite a bit in March after a great month in February. My wife’s credit card was hacked, so she had to get a new one. Consequently, we forgot to link the new card to the apps and didn’t earn any rewards from her spending. I got one referral to Dosh, and also made a few dollars on Drop from my normal shopping at Trader Joe’s, Starbucks, and Chipotle. While it wasn’t much money, I also didn’t have to do anything to make it! Dosh is very similar to Drop – once you link a credit card you don’t have to do anything else but collect your cash. Where Drop let’s you earn cash back at a set of specific stores that you choose, Dosh gives you cash back at wider range of stores. I’ve noticed that Dosh tends to have a lot of local restaurants in its list (usually with 5% cash back). Nothing to report for credit card rewards in March. We have a pretty good sized bank of Chase points stored up for future travel. We are planning a trip this summer, and trying to decide whether to fly or drive. If we fly, tickets are almost $500 each for a relatively short domestic flight, which is crazy to me. I need to look into credit card sign-up bonuses and get started on applying. If we take this trip it will definitely deplete our points. This month we earned $234. Most of our money is in an Ally Bank account earning 2.2%, but I am working on moving it over to CIT Bank which consistently pays the highest interest rate I’ve been able to find (currently 2.45%). In March, she helped a client finally buy a house after almost a year of looking off an on. After broker fees and other costs, she made $10,191! This represented a 2.5% commission on a $440k house. If I had to guess, she’s probably spent about 60-80 hours over the last year before finally closing on this house. That works out to around $150 per hour. I wish she could get one of these every month, but it does take time away from the family so just having one client here and there is our current goal. March Update: This month, we got checks from 2 of our investments – one for $333 and another for $425. We also used some of our cash sitting around earning 2.2% in the bank to invest in a fund that buys and manages retail shopping centers. Retail has been beaten up lately (somewhat unfairly in my opinion), and as such cap rates are higher. While there is some risk in retail of more and more shopping going online, there is some shopping that will always need to be done locally. I wouldn’t put my whole portfolio in retail, but the projected cash flow is good and the risk is diversified across several shopping centers, so I think it is good exposure for my real estate portfolio. We’ll see how things go! Rental properties is where our side hustle journey began. We are now 5 years in, and currently have a small portfolio of 7 units. We aim to make about $300 cash flow per month per unit, which has gotten harder to do the last couple years as real estate prices have risen. You can read the story of how we got started in real estate investing here. One of our tenants bought a house. The tenants on one side of our duplex bought a house and are moving out in a few days. When they move out, it will need some fairly extensive clean-up (needs new paint throughout, carpets cleaned, trees trimmed, leaning fence fixed, etc. ), so we are lining up contractors to do that. We advertised it for rent and in one week had 110 inquiries! We did one open house and collected a bunch of applications. Hopefully one of them will work out, if not we will continue to advertise it until we find qualified tenants. I always get a little anxious when we are looking for new tenants. We have pretty stringent screening criteria, but it is always hard to make the best decision with limited information on who the next renter should be. I spent a significant amount of time responding to emails and holding an open house for the unit we are looking to rent out – maybe around 10 hours this month. Most of the work comes when we are in the process of finding a new tenant, so that is to be expected. Other than that, the only other time spent on the rentals was putting this blog post together! I actually got my first checks this month! That $215 represents probably 3 or 4 months worth of affiliate income that finally paid out. It’s not a ton of money, but it’s a start. I’d love for my blog to eventually make $3-5,000 per month, but that is a long time away. For now, I am really enjoying the process of writing out my thoughts on various personal finance subjects, and trying to figure out what kinds of content my audience gets the most value out of. For example, I recently wrote an article on the Federal Employee Pension Calculation for one specific person (although I hope it helps more people in similar situations). So if you have suggestions for things you want to hear about – let me know! Congrats on a great month Andrew (and congrats to your wife)! I’d love to see an article, or a few, on the process and results with the flip. When I used to have cable, I always liked the shows about flipping houses. Thanks! Definitely plan to do some articles on the flipping process (with real numbers – not the ones they show on TV). It will be nice to have a current project to document instead of digging up an old one.